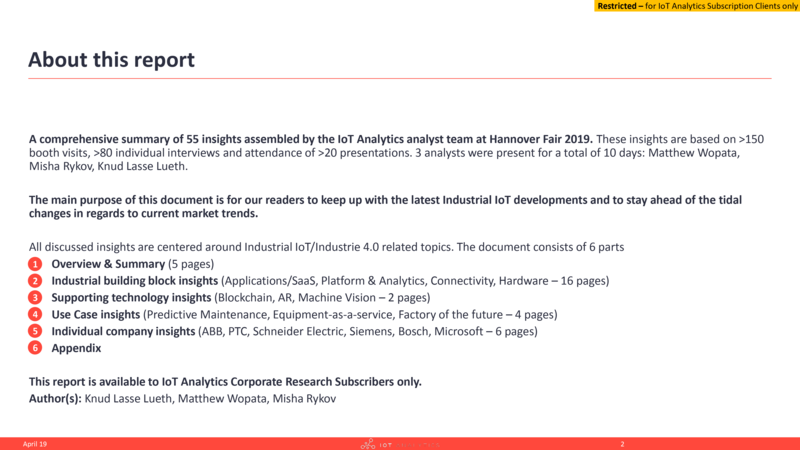 40-page PDF presenting a summary of insights the IoT Analytics analyst team at Hannover Fair 2019. These insights are based on >150 booth visits, >80 individual interviews and attendance of >20 presentations and is compiled for IoT Analytics subscription customers. 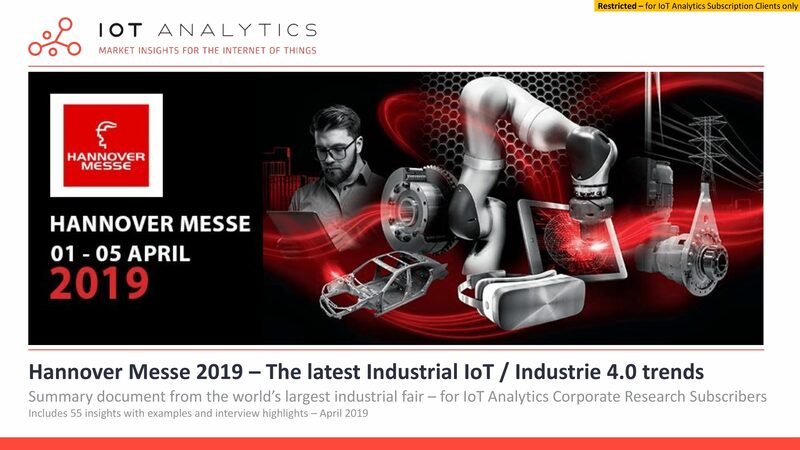 40-page PDF presenting a comprehensive summary of insights the IoT Analytics analyst team at Hannover Fair 2019. These insights are based on >150 booth visits, >80 individual interviews and attendance of >20 presentations. 3 analysts were present for a total of 10 days: Matthew Wopata, Misha Rykov, Knud Lasse Lueth. • 55 insights with examples/proof-points and interview highlights. • Supporting technology insights (Robotics, AR, Machine Vision, …). • Individual company insights (Siemens, Bosch, Microsoft, …). 5G was the most discussed industrial technology topic . Media analysis revealed that 5G was the most mentioned topic, besides the terms IoT, Cloud, Platforms, and MES. IoT was everywhere. Vendors of all types and sizes where touting their new “connected” and and “IoT” products. Cloud firms stole the show. The booths of cloud vendors had the highest traffic during the fair. Cobots – robots are becoming mobile and collaborative. Leading collaborative vendors had large booths promoting their cobots and its safer and easier use. Digital twin – physical devices get their virtual counterpart. A number of companies were showing how they have started to develop a digital software replica of some of their assets. Predictive Maintenance – becoming part of the overall maintenance workstream. Many companies showed off the trialing predictive maintenance of their assets. Further insights can be found in the report with relevant examples/proof-points. See also a related blog post.